Coconut Grove, Florida - A South Florida man is fighting to keep his male pet alligator, "Gwendolyn," that he has had for the past 47 years. David Van Buren says he has kept the gator as a pet, and even took his pet to college. "Once he was in the house, he didn't want to leave. I think it took us like three weeks to get him to go back outside. He was on the couch all the time, or in the bathtub," said Van Buren. Now that he's gotten too large to roam around his backyard in Coconut Grove, Florida Fish & Wildlife officials are stepping in to take the 13-foot-long reptile. Authorities received a complaint about the alligator and began to investigate. "Unfortunately, Gwendolyn the alligator is not in the proper caging it is supposed to be," FWC's Lorenzo Veloz offered. 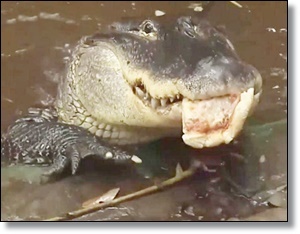 Van Buren feeds the alligator pizza and chocolate chip cookies -- Chips Ahoy are apparently his favorite -- and says he'll do whatever he can to keep him. There's no word yet on how long FWC will take to come to a decision, or where they would take Gwendolyn if they removed him from the home.